The CDSS believes in providing as much clear and correct information about Down syndrome as possible, in order to help prevent common misconceptions or offensive language. We have compiled a list of frequently asked questions with current facts and statistics about Down syndrome. Can’t find the answer to your question? Please contact us and we’ll be happy to help! There is no known cause for Down syndrome. Down syndrome is a naturally occurring chromosomal arrangement that has always been a part of the human condition. The sole characteristic shared by all people with Down syndrome is the presence of extra genetic material associated with the 21st chromosome. This happens because of an error during cell division when the egg and sperm first meet. The effects of that extra genetic material vary greatly from individual to individual. What are the types or “levels” of Down syndrome? Are there other names for Down syndrome? There are three types of Down syndrome – Trisomy 21 (the most common type of Down syndrome), Translocation, and Mosaicism. Is Down syndrome genetic? How is Down syndrome inherited? Of the three types of Down Syndrome, only translocation can be a genetic (inherited) chromosomal arrangement. 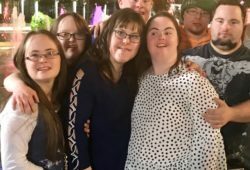 Why is Down syndrome important? What is the likelihood of having a baby with Down syndrome? What is the frequency of Down syndrome in births? In Canada, approximately 1 in every 781 live births results in a Down syndrome determination. Is there anything that can be done to increase or reduce the likelihood of having a baby with Down syndrome? There is nothing that can be done to cause or prevent becoming pregnant with a baby with Down syndrome. A baby with Down syndrome can be born to a mother of any age. What is the population of people with Down syndrome? There are an estimated 45,000 Canadians with Down syndrome. Is Down syndrome a disease? Is Down syndrome curable? Down syndrome is not a disease, disorder, defect or medical condition and therefore does not require treatment, prevention or a cure. It is inappropriate and offensive to refer to people with Down syndrome as “afflicted with” or “suffering from” it. Is Down syndrome a disability? Are there disabilities associated with Down syndrome? The extra genetic material from Down syndrome results in a developmental disability, but is impossible to suggest the level to which this will occur. Some individuals with Down syndrome may have other disabilities, however, they are not directly linked to having Down syndrome. “Mongoloid” is a term that is not appropriate to use when describing people with Down syndrome. It originally referred to people who resembled the ‘mongols’ but is no longer in technical/professional use. Are people with Down syndrome “mentally retarded”? People with Down syndrome may have an intellectual disability. However, the Down syndrome community is strongly against using the ‘r-word’ when describing people with disabilities. How is Down syndrome detected? Down syndrome may be detected through prenatal testing or after birth through a blood test. Do people with Down syndrome qualify for disability tax credit? Yes. For information on eligibility and the forms required, visit the Canada Revenue Agency web page for tax credits and deductions for persons with disabilities. Why do people with Down syndrome look similar? Some people with Down syndrome may share similar physical features. However, people with Down syndrome predominantly look like other members of their families. Who does Down syndrome affect? 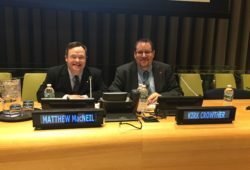 The Down syndrome chromosomal arrangement naturally occurs universally across all racial and gender lines, and it is present in approximately one in 781 births in Canada. How was Down syndrome discovered? John Langdon Down, a British physician, was the first person to fully describe the syndrome in 1866. It is one of the most common chromosomal abnormalities. The genetic cause of Down syndrome; an extra copy of chromosome 21; was identified by researchers in 1959. What is the history of Down syndrome? Down syndrome is a naturally occurring chromosomal arrangement that has always existed throughout history. While art and historical pieces portraying people with Down syndrome have been found dating as far back as 500 AD, Down syndrome was first characterized in 1862 by John Langdon Down. The treatment of people with Down syndrome has greatly improved throughout history. When CDSS began in 1987, people with Down syndrome were starting to live in their communities, and institutions were being closed. Today, with the right supports, CDSS has seen people with Down syndrome flourish in society. People with Down syndrome are contributing to their communities, living independently, getting married, and having meaningful employment. For comprehensive information about the history of Down syndrome, we recommend reading Down’s Syndrome: The History of a Disability by David Wright. Also see the History of Down Syndrome – Human and Civil Rights Timeline.